That's right, and here is my completed application above. I'm just generally curious here, but why aren't people rushing for season 1? I mean... dragons, right? That's fun! The other seasons are fun too. Well, yeah, I see the appeal in the others, true. If Aracho's gonna allow it, I'd love to do every season in order. But, I have no idea if anyone's got the time for that lol! @Arachobia: My season 1 character (Wyran) is now complete and ready for action. Last edited by MIniSchnauzer; 01-02-2019 at 04:57 AM. I'm confident in my own abilities and do what I can to instill confidence in others. When I set my mind to something, I follow through no matter what gets in my way. Ideal: People deserve to be treated with dignity and respect. Flaw: The tyrant who rules my land will stop at nothing to see me killed. Thia's rugged beauty belies her age, which is typical of her fey heritage, but it also wouldn't lead you to believe she's been on the run for the entirety of her adult life. As a child of a poor elven family that worked orchards in this is where I admit that I don't know the Forgotten Realms well at all, right?some far off land, she was often in trouble for blowing off tasks and ignoring authority figures. When she took Esandra, a nobleman's daughter, as a lover, she pushed things too far. Esandra was promised to Edwin, a wealthy merchant. Thia was run out of town on pain of death. She had to learn to make ends meet in all sorts of fashions. In the long run, she found that this actually suited her better, as she was able to do a task when she needed to for a little extra gold or a meal and then move on with her life. The lack of obligations was fantastic. Then, one night, she was working for a traveling minstrel show, helping them fold their caravan back up to hit the road, when a familiar voice rang out behind her. Esandra was there, playing with a beautiful golden-haired child. They were laughing and frolicking through the streets, and Thia was captivated. She watched the pair almost out of sight before she felt the steel under her chin. Thia barely got out of the way as the sword flicked and split the air where her jugular had recently been. She swept Edwin's legs out from under him with a swift kick and flicked herself up onto the partly dismantled stage. Screams when up from the remnants of the crowd. She heard the town watch call in response, and she turned to flee. Edwin's hand was around her ankle, and she slipped to the ground but managed to deliver a fierce blow to his nose with her heal. Another swift kick, and he freed her leg. She was running down alley after alley when finally she ducked into Madame Freona's Tea Kettle. Since someone just posted after me that they want season 1, let them have it and don't erase the two apps I made for 4 and 7. Folks can still apply for season 1, but you'll be reserve players. My cleric works for season sixth, so put me in that group too. Thanks, MIniSchnauzer. That's really kind of you. I'd like to apply for seasons 3 or 4, wherever I'm needed (feel free to slot my character in where the class is lacking). I'll get the full app up soon. UPDATE: I'll apply to season 4 if that is closer to being full. A brief description of your characters appearance, personality, and history: Andreth Blackstar was sent to the temple of Oghma as a young child, as his parents could not care for him and all of his siblings. He was raised by the priests, and excelled in his studies of the god of knowledge. Upon completion of his training, Andreth was assigned to restore a great library dedicated to Oghma, whose works were scattered throughout the world when it was sacked by invading goblins. Though all he wants is to return to transcribing great works of knowledge, Andreth must travel the lands, in search of valuable books he can use to accomplish his goal. Andreth wears mud-spattered travelling clothes that have been patched together from various items left in the temple's lost and found bin. Beneath them he wears the vestments of a cleric of Oghma, which are beginning to fray with over-use. Andreth comes off as awkward, but he is really disinterested in conversation that is not absolutely necessary. He is motivated solely by the desire to gain greater knowledge, although his strict code of honor ensures he will serve and protect those he has sworn to help. Traits: I watch over my friends as if they were a litter of newborn pups. I place no stock in wealthy or well-mannered folk. Money and manners won’t save you. Ideal: It is each person’s responsibility to contribute to the whole group. Bond: Years ago, I lost people I loved in a raid by creatures from the Underdark. They disappeared without a trace, either slain or taken into the depths, and I’ve always wondered whether they might still be alive and held as prisoners. Flaws: I remember every insult I've received and nurse a silent resentment toward anyone who’s ever wronged me. I am slow to trust others. Appearance: Physically, Nivrid is a fairly typical representative of her race. A bit more than three feet tall, a few more than thirty pounds in weight, chalky grey skin and white-grey hair. She is, however, hearty and robust. Solidly-built and lithely muscled, she has the look of one comfortable out of doors, making her own way in the world. She prefers light armor, well worn but impeccably maintained, and tends to wear heavier clothes to ward off the damp and chill that pervade the underground areas she calls home. Personality: Nivrid is cautious, stoic, and hard-working, but years on the surface have made her more light-hearted and accepting than is typical for her race...but that isn't saying much. She can be protective to a fault of those she cares for, but is unsurprisingly slow to give that trust. Elegant manners and wealth mean little to her - she values those whose skills and talents outside civilization can be relied upon. Has a tendency to nurse grudges. History: Nivrid was one of the first children born in the resettled Blingdenstone, and the pride and hope that the population had in them permeated her early years. Her parents had been lucky enough to flee the destruction of the city and survive the harsh, uncertain years that followed, and their main legacy to Nivrid was an unquenchable hate for the Drow and everything they stood for. As a child, she was always drawn to explore beyond the safely-repaired portions of the city, and her parents struggled mightily to contain her curiosity and adventurous spirit, which they called "more like a surface Gnome" or, even worse, "like a Gods-damned Half Elf". 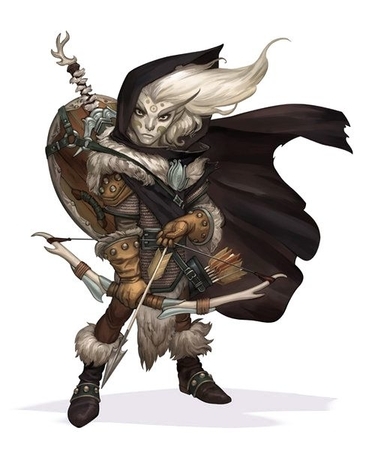 That adventurous spirit is why Nivrid was absent when her parents were killed or, worse, carried off by the Drow. It's also probably why she is alive today. As she approached Adulthood, Nivrid found herself drawn toward the surface, where opportunities existed far beyond those available in a Svirfneblin community. The years she spend combing the regions around Blingdenstone more than paid off for her, as she found regular employment leading groups of surface-dwellers down under the earth, into the Upper Dark. On the day her parents were taken by a Drow raiding party, she was negotiating her fee with a group of would-be treasure hunters. It was weeks before she would learn of their abduction. To this day, she has no idea what fate befell them. Last edited by Berith; 01-16-2019 at 02:40 PM.